Wet boots no longer! This simple dryer heats the inside of your shoes or boots after a day outdoors. The Power Cell PEET Dryer is small, silent, efficient, and it proved capable of drying my damp boots overnight. Release Date: On Market Now. Where To Test It: Ski town hotel rooms. After a day in the woods. Who’s It For: Outdoorsmen on the road with wet shoes or boots. Can be used on leather, PVC, rubber, neoprene, canvas, synthetics, cloth, fleece, or felt shoes. Specs: 12 watts, 110-120 volt. Plugs into wall outlet. Boring But Important: This simple and small device dries footwear with heat. With no fans, it runs silently and is portable. It helps eliminate odor in boots. Removes mold. Killer! Small enough to fit inside running shoes yet still effective on hiking and ski boots overnight. Inexpensive. 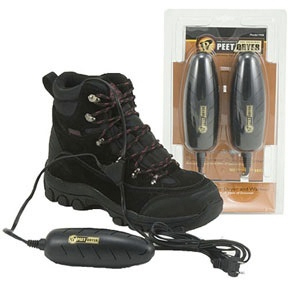 Flaw These won’t work on waders and are slower on large boots than fan-operated models. Our Take: A quick test on wet snowboard boots showed significant warming and drying in just a few hours. It’s a basic shoe/boot drier and warmer that will work great on light footwear and help dry out heavy boots more quickly than air circulation alone.